MACBETH:Verdi Original Air Date: 02/21/1959 Leinsdorf; Warren, Rysanek, Hines, Bergonzi MOD Audio SID.19160316This is the Met premiere broadcast of Macbeth, and at least three of the principals are as good as you’re going to get. … Continue reading "MACBETH"
MACBETH:Verdi Original Air Date: 02/21/1959 Leinsdorf; Warren, Rysanek, Hines, Bergonzi MOD Audio SID.19160636This is the Met premiere broadcast of Macbeth, and at least three of the principals are as good as you’re going to get. 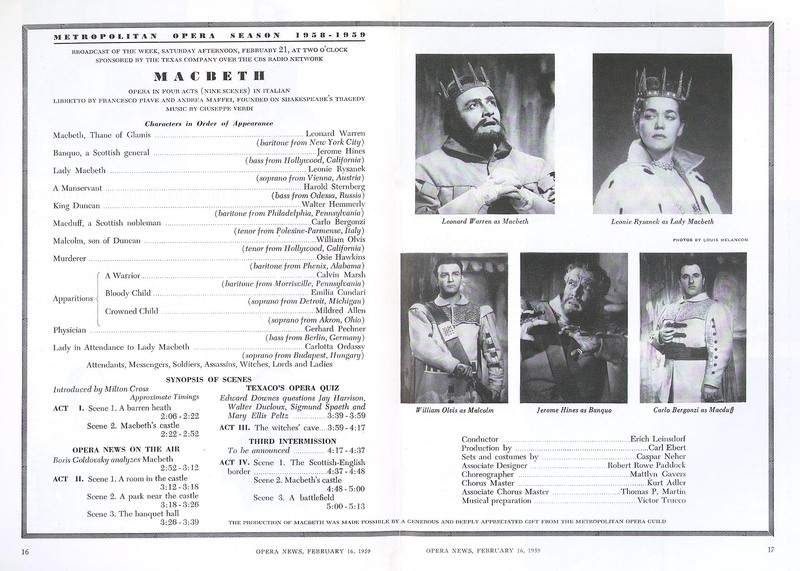 … Continue reading "MACBETH"
MACBETH:Verdi Original Air Date: 02/21/1959 Leinsdorf; Warren, Rysanek, Hines, Bergonzi MOD Audio SID.19160749This is the Met premiere broadcast of Macbeth, and at least three of the principals are as good as you’re going to get. … Continue reading "MACBETH"